Moving2Madrid - What lifestyle can I afford ? What lifestyle can I afford ? First of all, great news! Madrid has been named as one of the top 10 European cities with the lowest cost of living! Fantastic for anything thinking of a metropolitan lifestyle without a huge budget. over 4000 €: we can talk of a luxury lifestyle. Do also use Expatistan.com to compare the cost of living levels of Madrid to the city you’re moving from. For instance, according to them, life in London is 43 % more expensive than in Madrid. Then compare this difference in the cost of living to the revenue gap you will experience by moving to Madrid. Or directly ask one of your relocation experts to draw an optimized monthly expenses based on your lifestyle and budget, ask now for your free relocation consultation ! What is the breakdown of these costs ? Do read these articles as they detail the main items of of your budget. ask now for your free relocation consultation ! First of all, congratulations on the job offer! Have you taken a look at this article? There are a few other helpful links to other similar articles that will give you an idea of the cost of living here in Madrid. 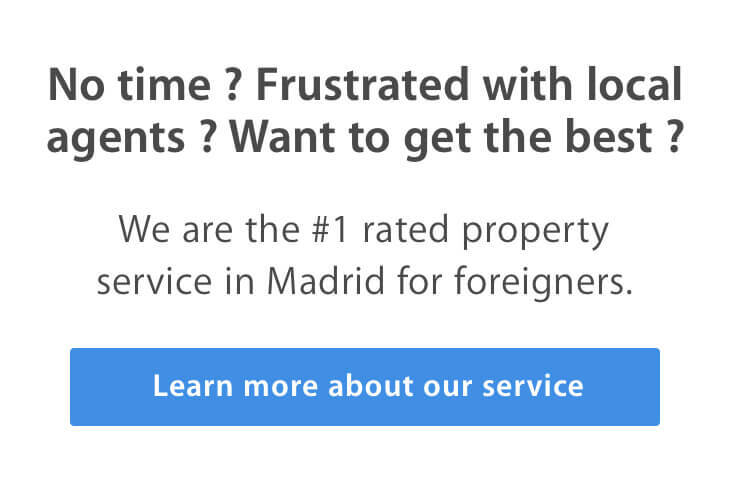 If we can help you with your move to Madrid, please don’t hesitate to get in touch. I have been offered a job with salary €55000…what type of lifestyle would this afford me in Madrid? Thanks so much for getting in touch with us. We have a few articles for you to take a look at. The first is on the cost of living in Madrid, then we have another one outlining rental prices, another one on the cost of utility bills, and a summarised review of average monthly costs. Madrid is a wonderfully flexible city in that you can live off a minimal budget, but it also allows for more comfortable living too. You can afford to have a social life, and to enjoy yourself here without having to scrimp and save too. I will be moving to madrid in August’15 next month. Can you please help me in revised monthly expenses. I would like know to services for searching an apartment near by “Calle Salvador de Madariaga “. Can you please tell me the rent details in a flat. Well, Breakfast, dinner and 1 room would amount to 500 to 700 € a month. You can then deduct this and estimate the right budget for you ! Cheers ! If I am living in madrid for 6 months for an abroad program and my breakfast and dinner and housing is covered, How should I budget per month? The monthly estimates are, as indicated, the cost of living. Therefore, just the money needed to pay for all things to liver here a month in a nutshell. You can then deduct that your take-home money is your Net or After-taxes money. Hope you find your answers and do comment if you still need help ! Are the monthly estimates above after taxes? I am having some trouble finding how much salary will be lost to taxes. Thank you for your blog! Yes, it includes everything ! I am moving to Madrid in a week. I would like to know, does the rent of the apartments included in amounts mentioned in the article or not? These estimates are applicable to one person. For a family of four, I would at least double it for the adults, and then add the school & kids costs. Private schools cost from 200 € to 1000 € a month, with an average at 350 €. Hi! Are these figures or estimates regarding “what life style can i afford” applicable to a family of four? (Husband & wife with 2 small kids?